The Artisterium V, the annual international contemporary art exhibition and series of public art events, opens in the Georgian capital of Tbilisi on October 5th, and runs through October 15, 2012. “Artisterium” is an evolving curatorial platform. Each year, its overall theme always responds to timely social concerns, such as alternative ways of development (“Modus Operandi – in Quest of a Different Way”, 2008), changes on general and personal levels (“The Manifest of Changes and an Inner Experience”, 2009), artistic reflection on re-envisioning the future (“Imagine the Future”, 2010) and the willingness to embrace open-ended subjects as a way to critically engage with important social, political, urban, private and aesthetic issues (“Free Fall”, 2011). chuka Nino Kuprava, the founding curator of the project, is a textile painter. She is a co-founder of the Georgian Textile Group, and head of the Educational and Exposition Programs at the State Silk Museum Tbilisi. During Artisterium, Streetwise artists will work closely with local designers, artists, cultural activists, as well as Georgians they meet on the streets—to imagine interventions within the Eliava neighborhood and establish an international network for an ongoing exchange of creative knowledge. Georgian artistic collaborators include students/faculty from the tbilisi State academy of arts and the center for contemporary art tbilisi, artists from the Fleet Group, Urban Reactor, Group Bouillon, the Georgian textile Group, the State Silk Museum, la Maison Bleue, artists recently involved in “Batumi Backyards project,” as well as the eliava Group project team. They will engage two sites: Artisterium’s Karvalsa gallery (which will serve as an active workshop space and staging ground for planning the week’s off-site projects), and the Eliava neighborhood (where most of the projects will manifest.) Between Oct. 6-13th, U.S. artists will offer public talks, educational workshops and opportunities to co-design site-specific works within Eliava Bazaar. The project explores what it means to be “street-wise”, emphasizing open-ended, cross-cultural exchange and a spirit of subversive play. their exchange will culminate in an open House celebration at eliava Bazaar on Saturday, october 13th, to which the public is invited. I must admit that I had barely heard of Tbilisi, Georgia before Lydia Matthews showed me the curatorial projects she had been working on there during my visit with her at Parsons in New York City. It still didn’t register until I got some an email from Laurie Lazer and Lydia while I was in Berlin. 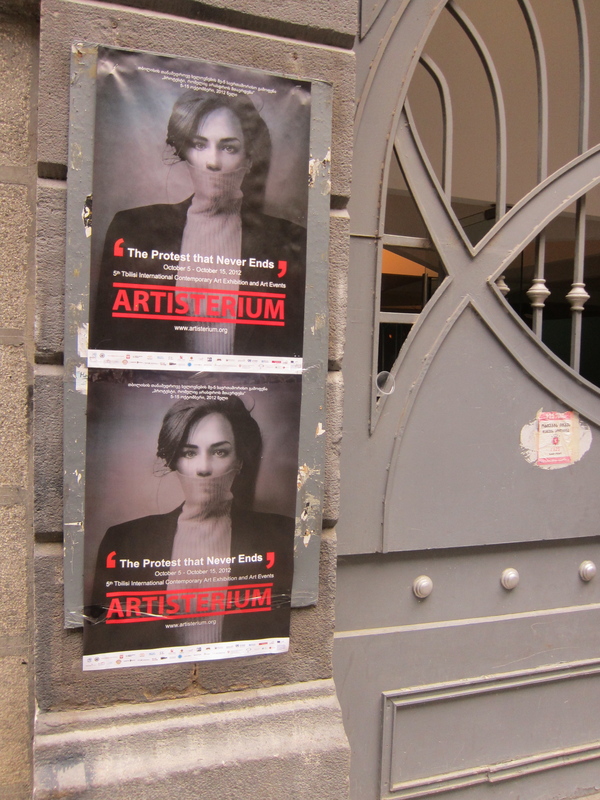 The US Embassy had come through with support to bring several artists from the United States to the Artisterium. Lydia, working with local textile artist Chuka, was planning Streetwise in the Eliava Bazaar and bringing artists who could intervene in this chaotic and challenging post soviet public market. Lydia sent pictures of the market to us and once I saw the stacks of tires thought of Tire Temple, a project I had done in Oakland with refugee kids from Cambodian New Generation. I didn’t know how I would make this happen in Eliava but I started collecting materials for the project and the lecture/workshop I was scheduled to give at the Tbilisi Art Academy in hopes of getting some students interested in working with me. Just a few days before the Artisterium opening Georgia was having its first parliamentary election and there were major street protests over prison abuse by the current administration. There was worry that there would be violence. The Georgian Dream party won and there were no protests while we were there. On Monday we went to Eliava. The sprawling market is a graveyard of crashed cars. We wound around the market till we came to rows and rows of stacked tires. At one corner was a particularly appealing tire set up with a view to the city behind it. Chuka introduced me to the merchant of this tire stall and the project began. Zakhro was welcoming, helpful and ready to be part of this strange art event that came come his way. I asked him what he wanted me to paint and he quickly answered a lion and eagle. The paint was fast drying toxic car enamel. The masks minimal but effective enough. It drizzled and got muddy. Eli, a young artist who volunteered to help me communicate quickly became a creative collaborator. Zahkro collected the discarded tires from the roofs and prepped them for us. I gave a lecture and had a workshop at the Tbilisi Art Academy. A group of students got excited about the project and decided to come work on it. Saturday’s opening was a transformation of social places and spaces.